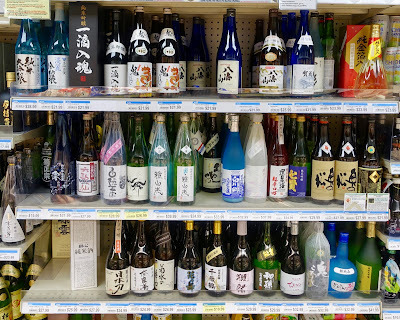 A Japanese grocery store is generally a terrific place to buy sake for selection, price and freshness -- which is very important. However, I have never seen anyone get useful advice from store staff. In making a choice, you're generally on your own. I took some photos at Nijiya in San Francisco to help you out. The Japanese grocery store in your city may have a different selection, but the buying principles will still apply. Sake is a much fresher product than wine. Most of the best sakes are not shelf-stable at room temperature. There are exceptions, and I'll go there. But start looking at the refrigerated ones. Japanese sakes are significantly better than U.S. sakes, but naturally U.S. sake producers are better at marketing to Americans. If you are a wine lover, you want a high-quality artisanal Japanese sake. Very few of the companies that make those hire U.S. label consultants. If the sake has a cute English name on the front, be suspicious. With wine, pricing is not strongly correlated to quality: a $20 wine can be better than a $300 wine. This is not true with sake, which is much more fairly priced. Up to about $100, sake generally gets better as you spend more. It's difficult to get a 720 ml bottle of good sake in the U.S. for less than about $25, but you don't have to spend more than that if you don't want to. Decide what your price range is, and take a closer look at the sakes in it. Please note that the sweet spot of quality/price ratio for sakes in the U.S. right now is somewhat higher than it is for wine: about $30-$40. Sakes on the bottom shelf are down there because they're cheap. There aren't any huge bargains in sake; you get as little as you pay for. Sake stays at its peak for maybe a week after opening. You can drink it after that, but it won't be as good. So don't economize by buying a 1.8-litre bottle unless you're having a party. 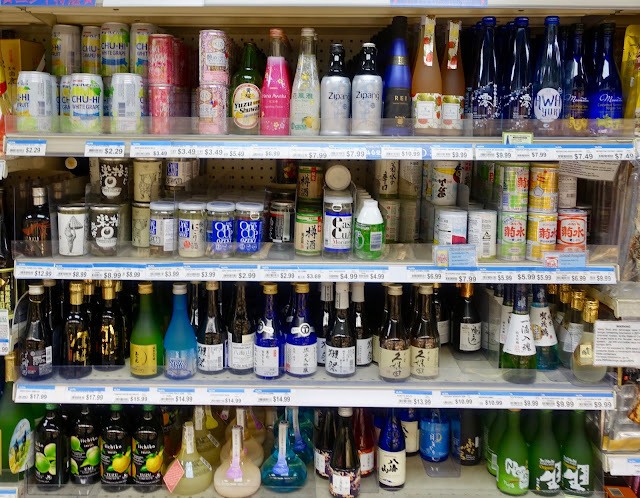 And store all open bottles of sake in the refrigerator, even bottles you bought that were unrefrigerated. I like to buy good 300 ml bottles if the store has them, but there's a lot of crap in the small bottle selections, so be careful. 720 ml bottles are the sweet spot size-wise for quality and availability. In the $30 range, you can afford a 720 ml bottle of junmai or junmai ginjo. Junmai sakes tend to be stronger, earthier, boozier. Junmai sakes also may be perfectly good on the non-refrigerated shelf (at left). Junmai ginjo sakes tend to be wine-like: fruitier. Junmai ginjo sakes are the easiest high quality sakes for wine lovers to love, so I recommend starting there. I would rather not buy a junmai ginjo sake that is not refrigerated. 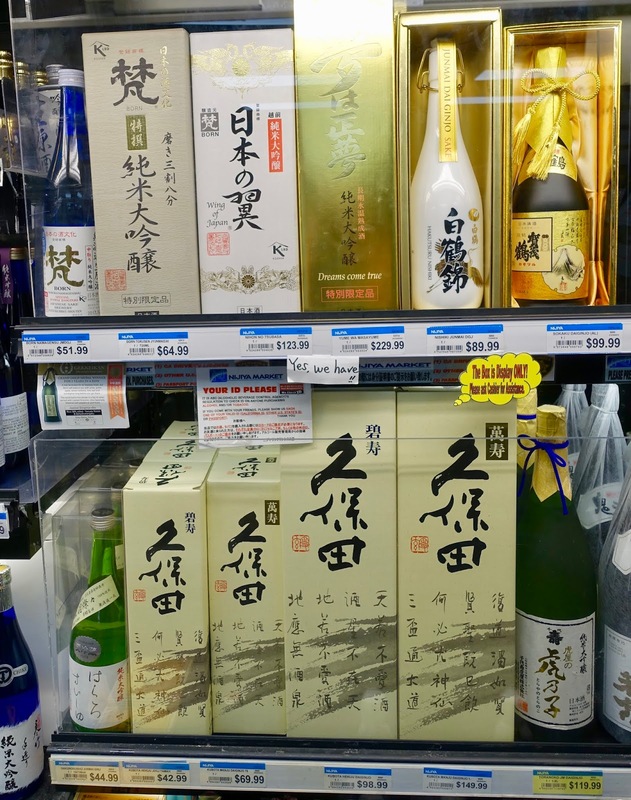 Junmai daiginjo is a step up in price over junmai ginjo. More of the rice grains are polished away, so they are more costly. I am suspicious of cheap junmai daiginjos. If you want a junmai daiginjo, either spend $40 or more, or buy a 300 ml bottle. 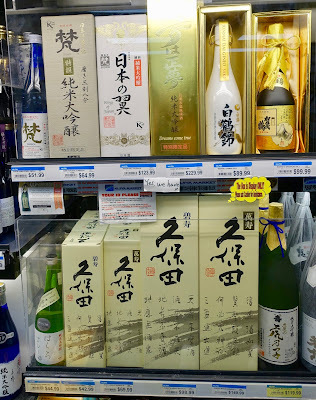 I would not even drink for free a junmai daiginjo sake that is not refrigerated. There's nothing wrong with these entry-level products just like there's nothing wrong with wine coolers and white Zinfandel, but you are reading this because you want something better. 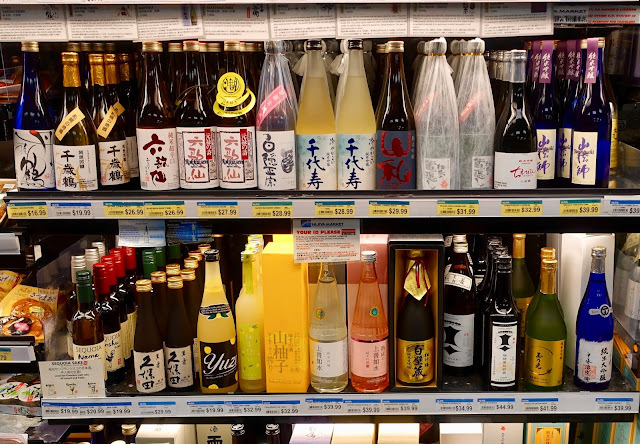 Nigori sake, often mistakenly referred to on restaurant wine lists as "unfiltered," is generally not drunk in Japan: it's only for Americans who don't know better. Now you do. In the photo above, there are only five sakes I'd be interested in trying, and there's a reason to be skeptical of all of them. On the second row from the top, the three expensive single-serving sakes to the left of the One Cup are interesting. In the middle of the third row, I like Hakkaisan Ginjo and Kubota Senju Ginjo. I would order any of these in a restaurant. One problem: I wish they were refrigerated. Note that all of the ones I would buy are expensive compared to their neighbors -- there are no real bargains in sake -- but in the case of the Hakkaisan and Kubota, they're not the most expensive. Gekkeikan, a big industrial brewery, has some marketing-driven 300 ml sake bottles that are beautiful. I would not buy those. They might also have the name in English. To traditional Japanese, calligraphy is cool and there's no reason to jazz it up with a drawing of a whale or a photo of a fruit. In the photo above, from the refrigerated section of mostly 720-ml bottles, I only really know 3 of them well, but I would spend my own money to drink 19 of them! Just try one. And while you're there, pick up some raw fish. Here's my pictorial guide to making sashimi at home. You will save so much money by making your own sashimi that you won't mind dropping $30-$40 on a bottle of sake. I will judge sake in Japan in October as part of Concours Mondial Sake Selection. I will try to answer your sake questions here in the comments or on Twitter at @wblakegray. You can also follow me on Instagram @wblakegray and like The Gray Report on Facebook. Great post! Question: Are the prices for premium sake in Japan significantly cheaper than imports into the US? Unknown: Yes. If you have reason to visit Japan, buy sake while you're there. But don't obsess on the fact that others pay less. The same is true of European wine in Europe.